The base version of the Dacia Duster starts at 11,990 euros. PARIS -- Dacia has been a big success for Renault since the automaker bought the Communist-era, Romanian brand in 1999. Dacia's secret is offering no-frills cars with unnecessary technology left out. Dacia's sales have grown nearly every year under Renault's ownership to a 3 percent market share in Europe. Sales increased by 12 percent through November last year, according to industry association ACEA. Its models are also sold worldwide badged as Renaults under the automaker's Global Access Program for low-cost cars. Dacia calls its development process "design to cost." A price target for a certain part is set, and designers, engineers and suppliers work together to meet that price. That strategy is on display in the refreshed Duster, the budget brand's compact SUV, which has sold about 2 million units globally since its introduction in 2010. The Duster, available in front- and four-wheel-drive versions, has continued to be popular. Executives did not want to raise the base price of the Duster, which is 11,990 euros in France -- though the most highly optioned four-wheel-drive models can approach 20,000 euros. The latest version of the Duster is currently being rolled out to dealerships. "We are extremely conscious when it comes to price," said Vincent Fournier, program manager for the Duster. "It is one of the main reasons people buy a Dacia. So during the development phase we monitored and optimized the cost of each item." "Every stakeholder has to understand the constraints of the order to reach the price," Fournier said, as he explained the design-to-cost process. Often, that takes trial and error. "For example, the first design for the Duster's roof bar was not easy to manufacture, because the curve of the part went in two directions," Fournier said. "The first quotation from the supplier was twice the target. The designer himself went to the supplier's plant to understand the manufacturing constraints," and the design was simplified. Another component of the process is using proven technology or simplifying existing technology used in other Renault Group brands. Renault's Alaskan pickup has a sophisticated "bird's-eye view" camera system that combines four cameras to create one overhead image. That was deemed too costly for the Duster, but product planners still wanted four cameras for off-road safety -- one in front, one at the rear and one on each side. "The electronics that make the picture from the views of all the cameras are one half of the cost of the whole system," Fournier said, "so in the design-to-cost spirit, we removed it." "We simplify the technology, and we can offer it at a very affordable price," he said. Under the skin, the Duster is largely the same and is still made on a version the Renault-Nissan alliance's BO platform. Buyers continue to have a choice of two gasoline engines, with 115 or 125 horsepower; two diesels, with 90 or 110 horsepower; and a liquid-propane gas hybrid (chosen by 35 percent of Dacia buyers in Italy). However, every body panel is new, and the subtle redesign is meant to emphasize the vehicle's ruggedness while still keeping a familiar shape. The front grille has been widened, the beltline has been raised, the windshield is moved forward and has a steeper rake, and the rear hatch has a more horizontal orientation. Front and rear skid plates have been enlarged. The interior has been redesigned with an emphasis on perceived quality and fit and finish. Responding to customer demand, Dacia has raised the position of the navigation screen by 74 mm, and seats have more lateral support and cushions that have been lengthened by 2 cm. Dacia has squeezed more storage into the cabin, including a 2.8-liter drawer under the passenger seat. Noise, vibration and harshness have been reduced up to 50 percent through new soundproofing materials, thicker door windows and a more rigid front structure, Dacia says. The Duster has been made more user-friendly, Dacia says, with a lower steering ratio, the four-camera multiview system, hill descent control, and keyless entry that detects a driver’s presence and automatically locks and unlocks the doors. 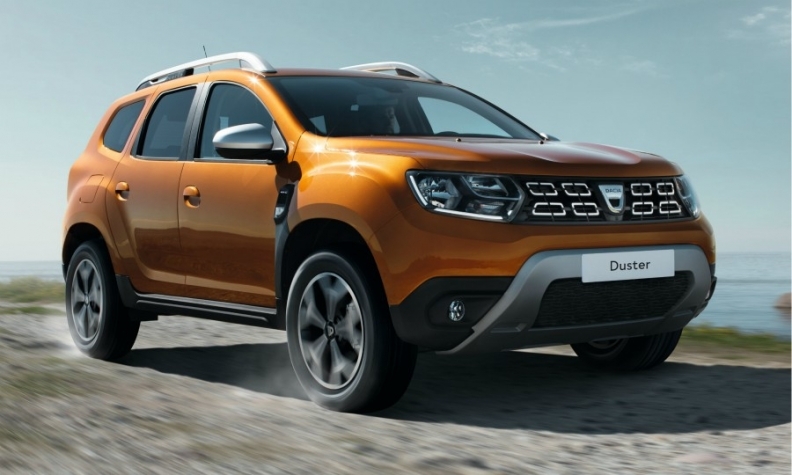 "The Duster is the most iconic model of the Dacia range," commercial director Francois Mariotte said in an interview at the Frankfurt auto show, where the facelifted Duster was introduced. "We have kept the best of Duster, and we have improved what we had to improve," Dacia expects to see a sales increase this year, but the company would not give a figure. Mariotte said the main question that Dacia buyers -- 40 percent of whom are coming from the used-car market -- are asking is "How can I get more without spending a lot?" That question also drives the company, he said. "Before spending a euro at Dacia, we really think more than twice," Mariotte said. "This way you can find a way to do things differently. The goal is to do things better without spending more."